Wow! Casio hit it out of park with their updated 3D Graph mode. When I first reviewed the Casio fx-CG 50 last June, one of the new features highlighted was the 3D Graph mode. At the time, the mode was limited to lines, planes, spheres, and cylinders. A good start, but limited mode. Not anymore. First, the update added cones to the template. The 3D Graph mode has become an official graphing mode because the mode now has functional graphing in the form of Z(X,Y). It doesn’t stop there. 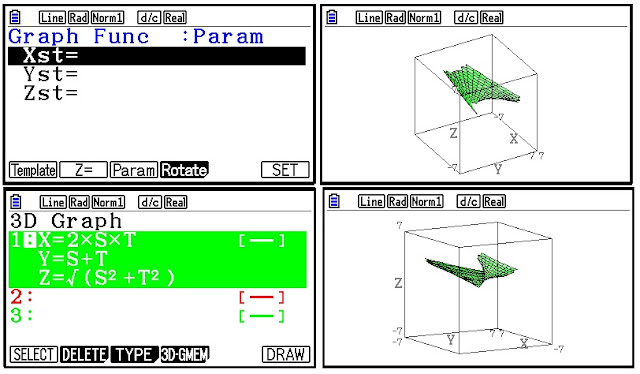 The mode also offers parametric graphing in the form of (X(S,T), Y(S,T), Z(S,T)). This might be my favorite part of the Graph 3D app. 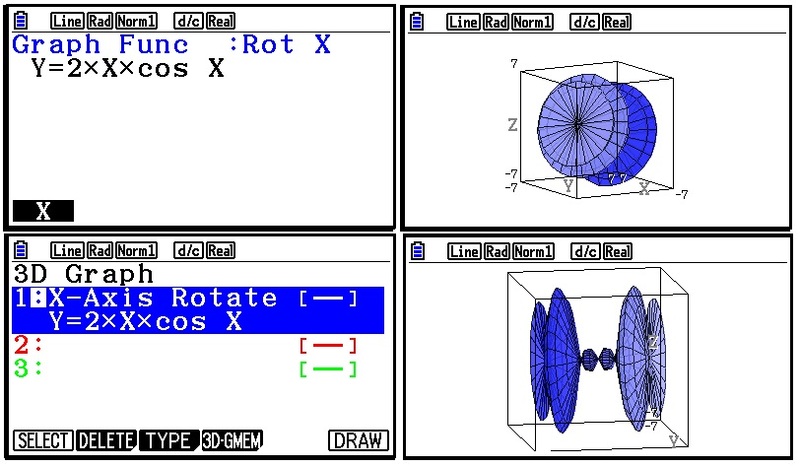 Finally, you can rotate Y(X) functions either by X or Y axis, to give a really neat visualization of functions. QR (Quick Response) codes, those small square bar codes that people scan with their smartphones to connect to certain webpages, have been added to most of the commands in the Catalog. Any QR reader should do. A successful reading of the bar code leads to Casio’s online manual. Count on Casio continuing the use of QR codes, in both graphing and non-graphing models. 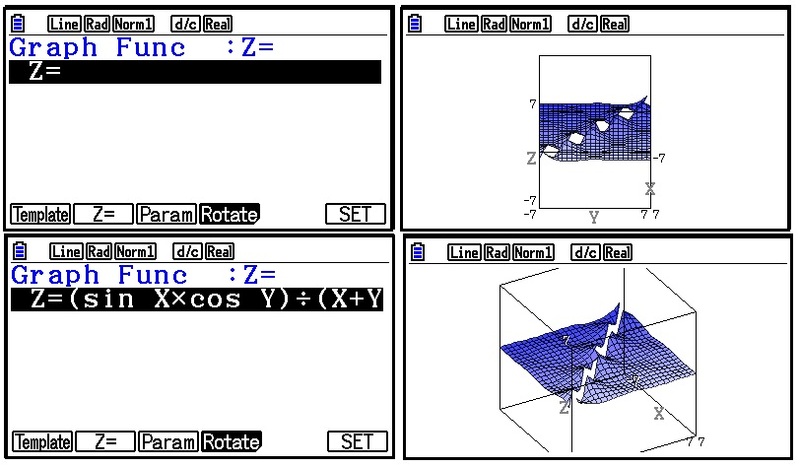 Recall that the fx-991 EX Classwiz has QR codes to display stat plots and screen shots through Casio’s Casio EDU+ software and app. Yes, QR codes generated by the catalog can be read by the Casio EDU+ app. I wish in the next update, Casio increases the number of colors to display text and graphs, currently there are still seven (black, blue, red, magenta, green, cyan, and yellow). At least put an RGB function. I think a differential equation graph mode or type would fit well with this series, even if it is just in the form of y’ = f(x,y,constants) and the Runge Kutta 4th order method is used. I suspect the next hardware of this series will have memory increased to at least 256MB or more. This series of calculators deserves to have such increase because of all the great things this series offers! 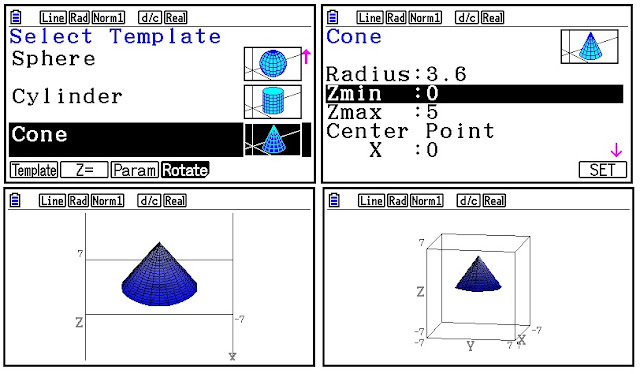 Please keep in mind you will need to install the Graph3D for the fx-CG 10 and fx-CG 20 Add-In separately. The Graph3D already comes with the fx-CG 50. 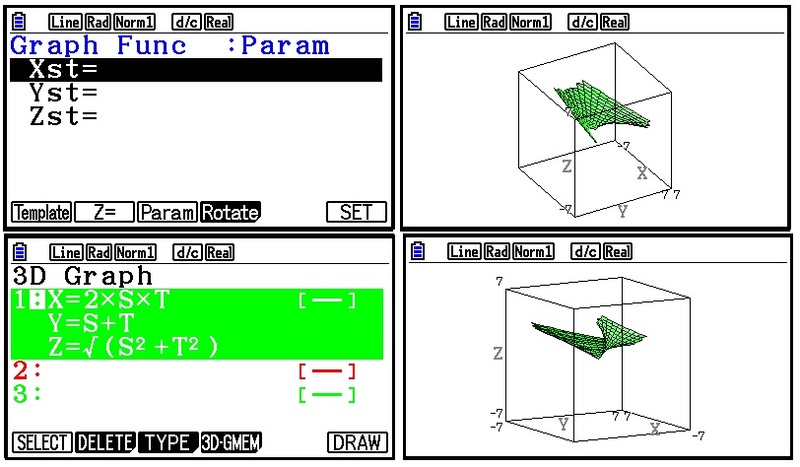 The era of third-dimensional graphing is here to stay! Thank you for this post. I just downloaded the 3.1 OS update to my new CG50. I really like this calculator. I wish Casio also made this their CAS calculator to compete with the Prime and NSPIRE CX CAS. This is so fun and easy to use.